The Briggs and Stratton twin impeller pump is a high quality and reliable product that you can depend on. 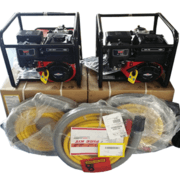 Suitable for multiple jobs such as irrigation sprinklers and fire pumps. 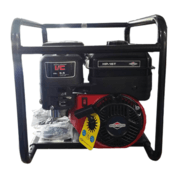 Powered by a 6.5HP Briggs & Stratton engine you will have all the power you need to tackle your specified job. This pump has extremely impressive high pressure performance for its price with 80m total head. Being able to pump 205 Litres per minute using the 1" outlet or 340 Litres per minute using the 1.5" outlet. With the engine protected by a durable frame as the product is built to last longer, with the rubber dampening footings.